William Tourtillotte is a visual artist and arts educator. He has been a Lecturer in the Fine Arts Department of the Raclin School for the Arts, at Indiana University South Bend in Printmaking since 2015. He held the position of Department and Division II Chair and Director of Vincent Gallery at Holy Cross College, Notre Dame, IN (2012-2015), and was formerly Chief Curator/Program Director (2000-2004) and Curator of Education (1995-2000) at the South Bend Museum of Art. 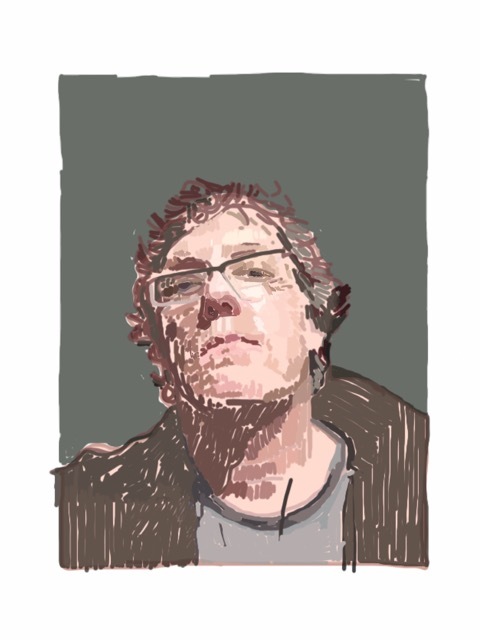 He has been a Visiting Assistant Professor of Art at The University of Notre Dame, Saint Mary’s College, Purdue University and Indiana University South Bend teaching printmaking, painting, drawing, sculpture, and digital graphic arts. As an art educator in the community, William has conducted cultural workshops, comic book classes, and painted murals with young artists, including a 2013 mural at the St. Joseph County Juvenile Justice Center in South Bend, IN. Using the art making process as a catalyst, William has established relationships across the community as a visual artist, an arts educator and an advocate for art’s ability to create a life not just a living. His collaborators have ranged from not-for-profit organizations to schools and community-based social services. He has witnessed the power of art to change how people perceive and engage the world. As an artist, William has recently exhibited his work in The Illustrated Accordion at the Kalamazoo Book Arts Center in Kalamazoo, MI and the Art and Social Justice Exhibition at the Colfax Cultural Center in South Bend, IN. His work can be seen in the Dot Shop at the South Bend Museum of Art. There you will find digigraphs or digital graphic drawings. They are a hybrid of graphite, ink and collage manipulated with scanning and digital rendering techniques. William earned a BFA from the Cleveland Institute of Art and an MFA from Cranbrook Academy of Art in Bloomfield Hills, Michigan. Bill shares a studio and small farm with his wife Julie and son Henry where they produce art, vegetables, flowers, and solar energy.